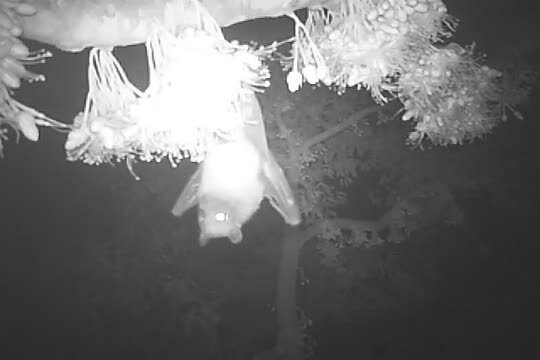 Scientists have discovered that Southeast Asia's endangered fruit bats - commonly known as flying foxes - play an important part in the pollination of the iconic and economically important durian tree. 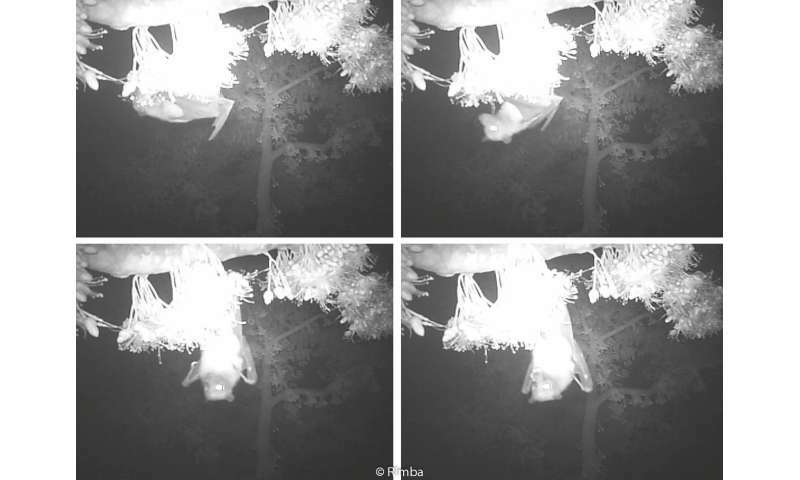 Using camera traps, researchers collected video evidence showing the island flying fox (Pteropus hypomelanus) pollinating durian flowers, leading to the production of healthy durian fruit. Their study - Pollination by the locally endangered island flying fox (Pteropus hypomelanus) enhances fruit production of the economically important durian (Durio zibethinus) - has been published in the Journal of Ecology and Evolution. The video footage was captured on Tioman Island by a team led by Dr Sheema Abdul Aziz as part of her PhD at the Muséum National d'Histoire Naturelle (France) in collaboration with the University of Nottingham Malaysia Campus. Dr Sheema said: "These are very important findings because they shed more light on the crucial ecosystem services provided by flying foxes. Previously it was known that the smaller, nectar-feeding bats are pollinators for durian - but many people believed that flying foxes were too large and destructive to play such a role. Our study shows the exact opposite: that these giant fruit bats are actually very effective in pollinating durian trees." The spikey tropical durian fruit, with its spikey skin and distinctive odour, is highly prized throughout Malaysia and Thailand. A ubiquitous icon of Southeast Asian culture, it is also a lucrative industry, generating millions of US dollars in local and international trade. The new findings suggest these economic profits owe a huge debt to large fruit bats such as flying foxes - as they were previously believed to be destructive rather than beneficial. Dr Ahimsa Campos-Arceiz, from the School of Environment and Geographical Sciences of the University of Nottingham Malaysia Campus and one of the coauthors of the study, said: "The durian is a fascinating plant that, with its flowers pollinated by bats and its seeds dispersed by large animals like elephants, beautifully exemplifies the importance of plant animal interactions. The durian fruit is particularly famous for its pungent smell and unique taste, adored by most people in Southeast Asia and so often misunderstood - abhorred? - by westerners. We hope this study brings attention to the urgency of conserving flying foxes in Southeast Asia." The island flying fox is already classified as 'endangered' on Malaysia's National Red List. Large fruit bats of the genus Pteropus are severely threatened by hunting and deforestation. They are often sold and eaten as exotic meat due to an unsubstantiated belief that consuming them can help cure asthma and other respiratory problems. They are also persecuted and killed as agricultural pests, as some people claim that the bats cause damage and economic loss by feeding on cultivated fruits. Consequently, these factors have led to a severe decline in flying fox populations worldwide. This study shows that these bats play important roles as seed dispersers and pollinators in rainforests, especially on islands. Their disappearance could therefore have repercussions for tropical ecosystems. This international team of researchers from Malaysia, France, India, and Thailand, in collaboration with Tree Climbers Malaysia, has found that Southeast Asia's durian supply could be affected too. Dr Sheema said: "If people end up hunting flying foxes to extinction, it's not hard to see that there could be serious implications for Southeast Asia's beloved 'King of Fruits'."